Defending fast paced players such as Neymar or Messi can be quite an uphill task. Luckily the offside rule ensures that attacking players do not have an upper hand when receiving passes while positioned ahead of the last defender. To enhance the defensive capabilities of their teams, many coaches have come up with clever ways of capitalizing on the offside rule in their favor by deploying the offside trap. This post will highlight the best offside trap drills to practice if you want your back line to invoke the offside rule as a defensive tactic. The details may seem a little bit complicated in theory but the accompanying videos and images will help you understand the details better. Communication is of utmost importance when executing an effective offside trap. The central defender needs to keep communicating with the rest of the defenders as they decide whether to step back or move up as a unit. To create an offside trap, the central defender will have to check if there are opposing players who may be in potentially offside positions, and if so, immediately instruct the back line to move higher up-field as the opposing team makes a pass to their attacking striker. This will leave the attacker in an offside position and the second official’s flag will go up. Creating an offside trap is a split-second decision that requires mental focus and coordination in order to execute effectively. Communication is imperative when setting up an effective offside trap. 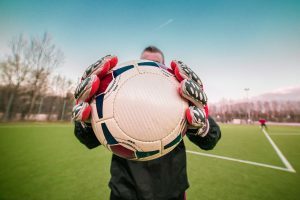 The goalkeeper, centerbacks and fullbacks have to practice how to keep an eye on each others positions and this can be done by shouting out to each other. In many cases the players have coded phrases that can be used which their opponents won’t be able to comprehend. So, before even coming up with a solid action plan the players have to learn how to communicate with each other in a way that will enable them to make split second decisions and work in unison. The video below gives you a couple of tips about effective communication with your teammates. The defenders have to know how to position themselves well in order to create a cohesive back line. The defense should always be conscious of where their teammates are positioned and also where the opposing forwards are at all times. The defense should practice how to move as a unit and switch positions when necessary. The defenders should also have a clear marking formation so that everyone is clear on who to mark at all times. The video below shows how defenders position themselves when executing an offside trap and how poor positioning can lead to a goal. When creating an offside trap it is important to make sure that the backline (consisting of 3-4 defenders) forms a straight line that is parallel to the the goal line. They should then practice moving up and down the field as a unit. This will enable the players to build cohesion when moving up field to leave attacking opponents in an offside position. The decision whether to create an offside trap or not is dependent on the position of the opposing attacker. So, the defense has to practice how to judge the threat of long shots from upfield in relation to the position of the attacker. Practice a number of long shots from different positions with one or two potential attackers close to the goal mouth. Normally the offside trap works well when long shots are anticipated by the defenders. So, what happens when the opposing team uses short penetrating passes to catch the defense unawares? This tactic is used to catch the defense flat footed and to counter it, the defense has to practice how to discern the potential of short passes and learn how to counter them with the offside trap. It is much riskier to attempt an offside trap based on short quick passes because the reaction time is too short. For this reason you need to practice how to read quick passes and use collective judgment to decide when to deploy the offside trap. Timing and working together is absolutely crucial but if you practice together often enough you can even spring this on the tiki-taka style football of the recent Spanish teams. The central defender should take on the role of the sweeper when setting up an offside trap. This means that he/she should be positioned slightly behind the rest of the teammates. The sweeper, therefore, has to set an offside line that is dependent on the other defenders and opposing attacker. In essence, the sweeper is the player who is most depended upon to determine whether to deploy the offside trap or not based on his/her position and judgment. The defense will have to practice how to keep in sync and anticipate the movement of the sweeper. So in this drill the sweeper will be tasked with initiating the command to move upfield once a pass has been made to the opposing attacker. The sweeper can shout ‘PUSH UP’ or ‘OUT OUT’ to signal the initiation offside trap. Do you really understand the offside rule? In order to understand about offside traps it is important to understand the offside rules. and its intricacies. Check out the video above for an in depth look at the various aspects of the offside rule. I hope this basic guide has been of use to you and will help you improve your defensive skills. As I mentioned earlier, these skills will help you create a solid defense strategy that is cohesive and efficient. The great thing about using an offside trap is that you do not even have to make one tackle when implementing it. All you need is great communication skills, good positioning, and a brilliant sweeper. Once you are able to create a bond and sense of unity within the defense, the drills will sharpen the players ability to make split second decisions and perform when under pressure. Another great benefit of the offside trap drills is that they help you sharpen your reflexes thus improving overall performance during games. Have you learned anything useful from this guide? I sure hope you did. If you feel like the content contains helpful information that could help a friend or family member please feel free to share it with them. What offside trap drills do you practice? Do you have any secret offside traps you'd like to share?